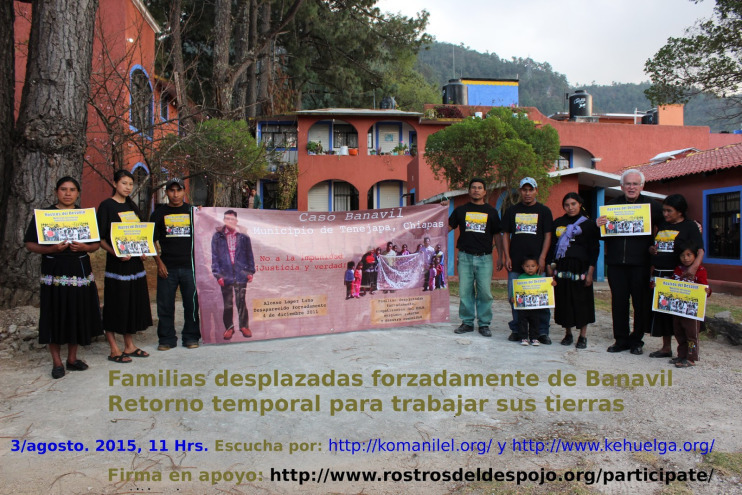 Families forcibly displaced from Banavil in the municipality of Tenejapa return temporarily to work their land. After the press conference, the displaced will return to their communities where they will remain for 15 days. We invite you to join us. On December 4, 2011, in the community of Banavil, Tenejapa municipality, Chiapas, members of the Institutional Revolutionary Party (PRI) attacked with firearms families supporting the Zapatista Army of National Liberation (EZLN). This event caused the forced displacement of 13 people, who lost everything and were prevented by threats from returning to their community. The attack caused the murder of Pedro Méndez López, the wounding of six other people and the forced disappearance of Alonso López Luna. In addition there were two arbitrary detentions: Lorenzo López Girón who was wounded by gunfire and charged with aggravated assault; and Francisco Santiz Lopez, EZLN support base, who was in a different place to that where the events occurred. Subsequently both gained their freedom, in the case of Francisco this was achieved thanks to the efforts of a special campaign with actions of international solidarity. Because of these serious human rights violations, justice and punishment are still being demanded for those responsible for the attacks. It is necessary to clarify the truth about the disappearance of Mr. Alonso López Luna demand his live appearance.